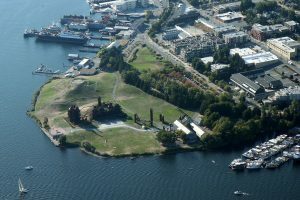 With its reputation for mercurial weather, grunge, and techies – Seattle is usually not at the top of any list of cities for couples’ fun or things for couples to do in Seattle. However, the city is bursting with perfect spots and experiences. Art walks, nature hikes (the birds & the bats anyone? ), dining on the harbor, Shakespeare in the park, swanky oyster bars and drive-ins are on the offer in this dynamic city. Below are just a few of the cool thing for couples to experience in Seattle in the midst of all the subculture and innovators. While the masses stand in line and take selfies at the Space Needle, head to the 73rd floor of the Columbia Center, the tallest building in the state of Washington. On weekdays, beginning at 3PM, treat yourselves to happy hour at the observatory’s cafe, while every fourth sentence you remark that you only spend five dollars to get up there. Often the most famous place in a city is over-hyped and over-saturated. Fortunately, this cannot be said about Pike Place Market. Whether you’re together because you can quickly list five semi-dry reds to have with dinner, one of you is a grill master, or you order dinner based on which delivery person you want to see that night – there is something for any couple at the Pike Place Market. The best fun to be had anywhere in the Northwest is on the water. A memorable, thrilling activity is to rent a double kayak and go out on lake, canal and sound. Admire the houseboats, maneuver near the cruise ships and freighters, while making friends with a harbor seal or two. End your trek at one of Seattle’s best-kept secrets – Gas Works Park, a park built on the site of an old gasification plant. If getting gear, renting a kayak and getting a workout on the water sounds more like a chore than a fun day with your sweetie – take the ferry. Washington State Ferries offers a great view of the sound and skyline. Take the thirty-five minute trip out to Bainbridge. Bring your bike and explore this city’s shore of with cozy cafes and storefronts. For an extra special experience, time the boat for sunset. On the weekends, head to the Ballard neighborhood. Swing, tango and salsa lessons get the night started followed by hours of dancing (or have equal fun watching). Go back to the neighborhood to their long-standing Monday night tradition of square dancing at the Tractor Tavern. Don’t want the night to end? Calm down and get artsy at Silent Movie Mondays at the Paramount Theatre. An organist playing to the cinematic cues often accompanies movies. Speaking of movies, memorable cinematic couples often find themselves either in harrowing situations or going about their daily lives when their soul mate appears. Go underground into the subterranean passageways of Seattle by taking the Beneath the Streets tour in Pioneer Square. Explore recently opened tunnels and impress friends with “only in Seattle” facts. After, “escape” up into a waterfall that’s hiding in plain sight. The twenty-two foot waterfall, sitting at the back of Occidental Square Park begs for attention and attendance at your picnic (pick up wine and cheese from the nearby Little London Plane). Get High – Up in the Air That Is! 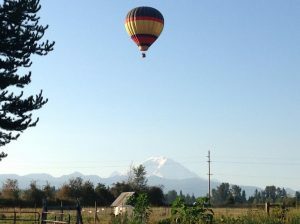 Head down to SeaTac to catch a balloon ride – Seattle Ballooning offers incredible views of Mt. Rainer and some delectable tastes while in the air. It’s the perfect adventure date or even a spectacular location to spend an anniversary or other momentous occasion. One of the great things about Seattle is the abundance of neighborhoods with fantastic restaurants. You can find eateries spanning from dinners and dives all the way to elegant restaurants and private clubs with renowned chefs and culinary surprises. For a truly outside-the-box couples experience plan a gourmet tour or join a planned tour that includes the Public Market, Belltown and more incredible locations. We definitely recommend hitting up some of the fantastic wineries and breweries in the area while you’re at it! Regardless of what you fancy, Seattle has some great places for couples to share a daytime rendezvous, a weekend getaway, or a week-long extravaganza among the many things for couples to do in Seattle. From its rich culture, to its famous music, to the tech hub it is today, there’s no reason you and your sweet heart can’t grab a Starbucks and start planning some special time together.